My name is Marcy Beaupied, and if you sign up for the Project Artwork Club, I'll be your child's art teacher! I have taught art for fourteen years, working with every age group from preschool up to 12th grade. About four years into my career as an art teacher, I decided to start an after-school program for all of the children who loved art and were disappointed it was only offered once-a-week during “specials” time. My thought was--and still is--that art should not be reserved for a special time, but rather, incorporated into everyday life. I had previously home-schooled my son, and felt that an integrated approach to learning was best, so I desired to create a program that would use the art-making process to help students also learn about math, science, history, literature, music, and the world around them. I knew I wanted to expose students to a wide variety of artistic mediums and teach them real design concepts and techniques, while fostering and encouraging their budding creativity. I wanted to lead with ART, but connect it to real life! I began creating art units centered around a fun, attention-grabbing theme. It was a hit! The kids loved exploring a subject in depth, interacting with and processing the things they were learning through hands-on art-making. Project Artwork was born, and I’ve had the privilege of seeing this program grow for over a decade while working with some AMAZING students! Parents of my students repeatedly tell me that their kiddos LOVE my classes and that they are amazed at what their child was able to do with my instruction. Over the years, I've had MANY homeschoolers ask for my help. Most of the parents who sought my help were ones who knew art was important, saw talent in their child, but felt like they weren't artistic enough themselves to really help them. Some were able to take classes in my after-school program, but many were not due to scheduling conflicts or budget constraints. I know when I homeschooled my own son I got so worn out from running him to different lessons and programs all over town, and the costs of cobbling together my own curriculum for every subject quickly added up. When it came to something I wasn't particularly good at, like science or sports, I wanted a passionate mentor with expertise to teach him and inspire him. A couple of years ago my husband and I had our "light-bulb" moment. He had been a long-time video producer; I had been a long-time art teacher. Couldn't we combine our efforts and create video lessons for all the families out there who really needed some help providing a rich art experience for their children at home? That is exactly what we have done with the Project Artwork Club, and I have to tell you, I am SUPER excited about how video instruction offers a way for kids to learn art that, I feel, is vastly superior to a traditional classroom setting. The material can be self-paced--they can repeat what they miss, replay any section, pause when they need a break. The video is able to offer kids a close-up view of what the teacher's hands are doing and all the tiny details on the page. Certain segments are sped up, allowing kids to get a great overview of the important parts and not lose interest during the incidentals. I find kids to be 99% more focused on the content--let's face it, whether we like it or not, they're used to looking at screens! Opportunities for accelerated learning- kids can gain mastery and move on to new projects as quickly as they would like. Want to see if video-based instruction is a good fit For Your Young artist? Want to get a feel for my teaching style? My mother likes to say she painted my bedroom bright yellow as a baby, because she heard yellow was the color of creativity. As a young girl growing up in Alabama, I spent a lot of time outdoors building forts and designing fairy houses out of mosses and acorns. My mother had a ceramics studio in the basement, and I loved to help her prep her greenware. My best friend and I had three passions: exploring nature, reading, and drawing animals, which we did obsessively! Somewhere along the way, I learned how to sew and began to teach myself how to paint and collage. When I was a teen, my family bought a flower shop and moved to sunny South Florida. I was put to work learning the art of arranging flowers, making three-dimensional, living sculptures. I honed this craft for the next 20 years, while continuing my higher education and eventually obtaining my Bachelor of Science in Education with a Specialization and Certification in Art (wow, that’s a mouthful!) I then started my career as an elementary art teacher at a small private school. 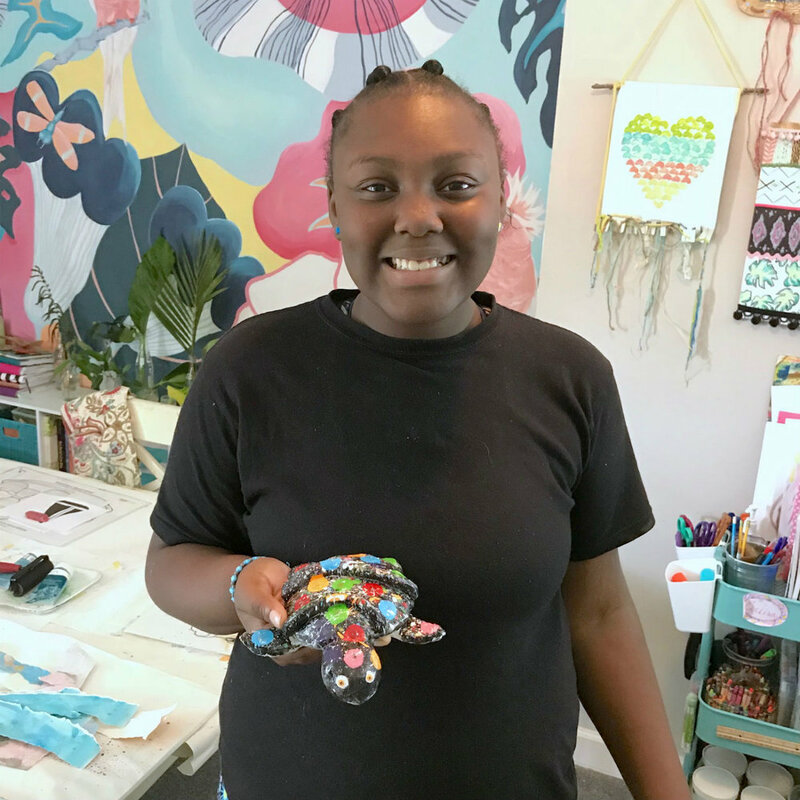 In addition to teaching in the private school and running my after school classes, over the years, I have taught summer camps, workshops, and hosted week-long immersive classes for small, mixed age groups in my home art studio. And of course I have loved teaching art at home to my own two children! My love of animals and nature shows up in my art and many of my lessons have great connections with the natural sciences! A while back, I had the opportunity to take a year and teach at the high school level. It was such a great opportunity to experience and take back to my younger Project Artwork students. I felt like knowing what the older students were capable of and what the different colleges and fine arts schools were going to require, allowed me to be more intentional about what I was bringing out in my younger students. I wanted my students to begin thinking compositionally–even at a young age– while working intuitively. My philosophy as an art teacher is to help children PAY ATTENTION, BE INSPIRED, and RESPOND CREATIVELY. I want young artists to slow down, be curious, and tune in to the world around them. I want them to latch on to what inspires them. And I want them to put that inspiration through their unique, artistic filter and create something AMAZING! I believe that the creative process, forces young minds to be keen observers, creative solution-finders, adept decision-makers, and hopefully, thoughtful risk-takers. I believe that art helps students forge connections with other subjects they are learning about, and that working with a wide range of materials gives them a broad repertoire of skills to use as they grow and mature. 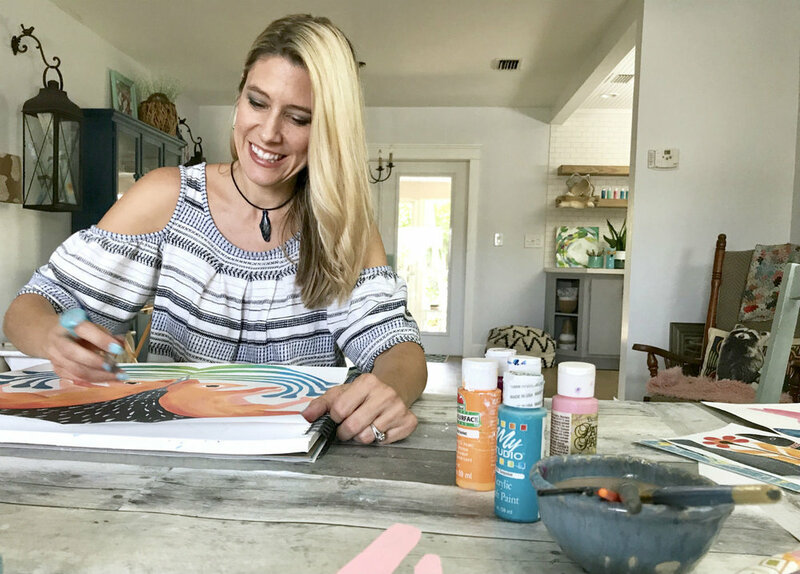 If you are at all considering doing art at home as part of your regular, homeschool routine, I can make that process EASY for you! 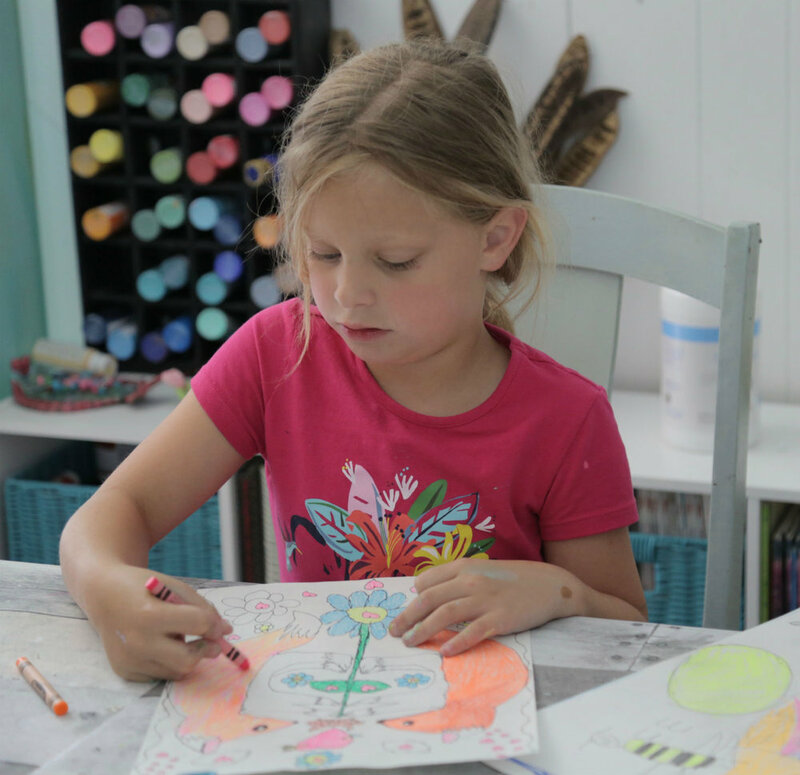 JOin the project Artwork Club and get access to a library of beautiful art projects, with video tutorials that walk your kids through each step of the process, from gathering supplies to sharing their finished artwork with the world!